Left: Hoya bordenii Schltr. 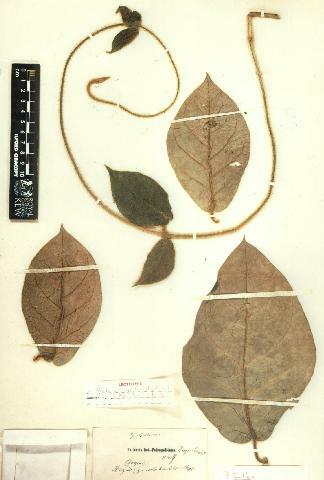 (IML-775), identified by David J. Liddle. Right: Unidentified hoya species, mislabeled as this species in Kloppenburg’s World of Hoyas and on the cover of Fraterna 10(3): 1997). For much of the late summer and early autumn, many wrote to me with questions about Hoya bordenii. Most of the writers had obtained cuttings of Hoya bordenii from a Hoya Society International plant sale and had learned that the flowers on their plants don’t match those in Mr. Kloppenburg’s more recent publications. They want to know why. Mr. Kloppenburg has written at least nine or ten hoya books over the last ten years. Most were written at just the point when he should have begun researching his subject. We know that he didn’t do any research (or little) because he told us that he had to choose between researching his subject and writing about it. You’ll find that admission in the preface of his Hoya Handbook. The rate at which he put out books since making that statement is a good indication that he had no time for research since then. Schlechter said: “Middle with a short linear longitudinal ridge or hump.” Nowhere did he say that this ridge (or hump) was in two parts with an umbo in the middle. In fact no mention of an umbo is to be found in the description. An umbo is round with a projecting point in the middle of something, such as the “boss” on a shield. It is suspected that Kloppenburg got the idea that an umbo was present because of confusing umbo with the word Schlechter used, i. e., gibbo (a convex swelling or humpback). We know that Schlechter’s “gibbo” was not round like an umbo for two reasons. 1). Schlechter said it was “linear” and 2). Schlechter drew a picture to show us its shape. The word “breviore” which Kloppenburg must have interpreted as meaning short in length actually means “short in height.” The way we know that is from examining actual flowers attached to his type specimen (as I did) and also by Schlechter’s sketch which was attached to the type specimen. Take a look for yourself. .
g) Corona lobe beneath; h) Corona lobe above. 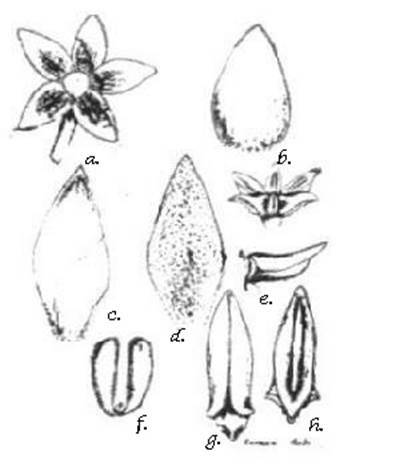 The above illustration is what Kloppenburg calls “Schlechter’s beautiful drawings” of Hoya bordenii’s various flower parts. Look at the upper surface of the corona lobe (fig. h. at lower right). Note that the gibbo (longitudinal raised area) extends unbroken for just about the entire length with no sign of an umbo. I leave it for you to decide if you think Schlechter’s sketches should be called “beautiful drawings.” Except for the completely inaccurate pollinarium, I find the sketches adequate but crudely executed. Hoya bordenii is NOT the only species featured in World of Hoyas that is illustrated with a mislabeled picture. Nor is it the only one with a lot of fiction written about it. There is hardly an error free page in the entire publication. Titles of references entirely wrong or misspelled; authors’ names entirely wrong or misspelled; majority of cited dates wrong; most geographical locations wrong; upside down pages; missing pages and sloppy reproduction are just some of the things wrong with this book which costs enough to feed a homeless family of four for a month. This caliber of book is not needed! Watch this site for more corrections of major errors found in World of Hoyas. Letter #1: “I am very interested in Hoya History and have tried to look up as many references in old time journals as I can find. I’m also interested in knowing about the people who collected hoyas and had species named for them. In fact, I’m interested in knowing the reasons behind the naming of any plants. I’d always thought that species names ending in ii were species named for men, but recently I read a statement made by Mr. Kloppenburg that Hoya praetorii was named for a place on the island of Sumatra. I’m planning a trip to Sumatra and am marking a map to show all the places hoyas have been known to grow and would like to go to as many of those places as I can. I’ve searched maps, old and new, and cannot find such a place as Praetoria. Do you have any idea where it is?” -- Long time hoya collector from CT. Reply: No such place. What you have run into is just more Kloppenburgese. The fact is that Hoya praetorii was named for its collector, Christiaan Frederik Eduard Praetorius, who lived from 1799 to 1846. You can find proof of this in Flora Indiae Batavae, Vol. 2, page 526 (1856). It was also repeated in The Hoyan, Vol. 9, #1, page 32. Letter #2: Are all of these names cultivars or species? Hoya macgillivrayi, H. macgillivrayi ‘Coen River’, H. macgillivrayi ‘Langkelly Creek,’ H. macgillivrayi ‘Pandanus Creek,’ H. macgillivrayi ‘Massey River,’ H. macgillivrayi ‘Mt. Tozar,’ and H. macgillivrayi ‘Superba.’ – Members of Garden Web Forum & HoyaHeads Forum. Reply: All are written in the manner prescribed for writing cultivar names but none of them are cultivars. Those names (except for the last one) are the names of the places where David Liddle and/or other Australian collectors found the “mama” plants of those various clones growing. All are easily recognized as Hoya macgillivrayi but each differs in a minor way from each of the others. Sometimes such differences are temporary, due to environment. They often disappear when two clones with different geographical origins are grown together in the same environment. The collectors keep the names of the collections sites attached in order to be able to observe them over time and in different places to learn if these differences are permanent. The name Hoya macgillivrayi ‘Superba’ has no status. It is a made up name, originating with Mr. Ted Green, for the first Hoya macgillivrayi in our collections. Up until the late Peter Tsang sent 65 cuttings of this plant to me to sell to Hoya Society International members, everyone thought that the plant we now know to be Hoya onychoides was Hoya macgillivrayi. Most of us thought it not quite as F. M. Bailey had drawn it but we rationalized that, “Well, Mr. Bailey simply couldn’t draw well.” Turned out his drawing ability, while crude, was still quite accurate in showing the flatter flowers of Hoya macgillivrayi. Mr. Green created the name “Superba” for the species Hoya macgillivrayi to distinguish it from Hoya onychoides which, until then, we all thought was a smaller flowered form of the same species. Letter #3: I’ve read statements made by you that there is no such hoya as Hoya gonoloboides yet I continue to see it listed by such nurseries as Eva-Karin’s and Botanova (Swedish nurseries). They must know something that you don’t. – Several Swedish correspondents. “Hoya gonoloboides” - which isn’t a hoya at all. Acti Horti Petropolitani, Vol. 8, page 642 in 1883 by Edward von Regel. It was described as having “dark brown, bristly-hirsute stalks and membranous, pinnately nerved, reticulately veined, cordate, ovate, acuminate leaves which are covered on both sides with stiff bristly reddish hairs.” The plant that is being sold mislabeled as this species is completely glabrous except for the flowers. If your “Hoya gonoloboides” doesn’t look like the picture above, you don’t have Hoya gonoloboides. If your “Hoya gonoloboides” does look like the picture above, you still don’t have Hoya gonoloboides. There is no Hoya gonoloboides! I’d like to tell you that all the dealers on this list have a lot of inexpensive hoyas that are all correctly labeled. If I did, I’d be lying. Even the best one has mislabeled plants. Most try but can’t keep up with the “label sellers.” A few don’t even try to get the labels right. Some deliberately mislabel to keep sales’ volumes high. A good place to air your grievances against such dealers is http://gardenwatchdog.com/ -- you can tell the world about the companies that please or displease you and you can do it anonymously. If your complaints to a dealer don’t bring the desired results go to that site and tell the world so the dealer can see what his customers really think of him/her. I have never reported anything there because I see no need to hide my feelings behind an anonymous name. If you are shyer than I am, say it there. D.J. & I. M. Liddle, P. O. Box 794, Mareeba, Queensland, 4880, Australia. It is suggested that US Customers send 2 or 3 International Reply Coupons when requesting a catalog (You buy them at the post office). This nursery has more hoyas than any other single nursery in the world. At last count nearly 1500. Of course there aren’t that many species. Being hoya researchers they collect many examples of the same species from many different locations in order to learn how variable a species is likely to be. They have all that anyone else has and at very inexpensive prices. The down side is, they are charged a very high price for each package they export so if you only want one or two things on the list the cost to you will be somewhere in the neighborhood of $75 to a $100 plus the catalog price. Many US customers pool orders to the Liddle’s and have all orders sent to a single address. I suggest that you try to find someone to accept delivery who has the facilities and the expertise to root them before sending them on to you. Count on losing some plants when they have to travel so far. Warning: The Liddles do not list every hoya they own in every catalog. They select the things that they have that are in plentiful supply. What you see one year may not be listed the next but is likely to appear later on. Duffey’s Tropicals, 2118 Poinciana Ter., Clearwater, FL 33760-0447. Send a dollar for a catalog or email for one at hoyalady@email.msn.com. Her customers praise her highly. I was surprised, however, open obtaining her catalog to see a number of mislabeled plants whose correct identity has been long established. You can also purchase back issues of The Hoyan from Duffey’s. Glasshouse Works, P. O. 97, Stewart, OH. Like the Liddle’s of Australia, Tom Winn and Ken Frieling of Glasshouse Works do not list all of their extensive hoya collection every year. Some slow growers and some that are extremely popular sometimes leave stock plants with few places to take cuts so many species are given vacations so that they can replenish themselves before being offered for sale again. If you live near Stewart, OH, give them a call and visit them. They have a lot of really rare plants in a lot of different genera. Don’t judge them by their lousy web page. Order a catalog. Green: Plant Research, P. O. Box 597, Kaaawa, HI 96730, phone: (808) 237-8672. This grower’s claim to have introduced more hoyas and to have the largest hoya collection in the world is grossly exaggerated but he does have a lot. http://www.rare-hoyas.com/ is where you’ll find his on line catalog. I’m told that he’ll allow walk-ins by appointment. The plus side is that you can find all the lastest finds first. Don’t trust the labeling as much of it is wrong. He has a bad habit of labeling a hoya by one name and then changing the name on that same hoya the next year. He doesn’t always tell you that what he’s selling this year is not the same species he sold with the same name last year. Logee’s Greenhouses, Ltd., 141 North Street, Danielson, CT 06239-1939. Catalog costs $2.00 (refundable with 1st order). I’ve heard conflicting reports about reliability and plant quality. I’ve never gotten any but the healthiest plants from this source but I haven’t bought since the younger generation of Martins took over the running of the business. Most of the hoyas featured are mislabeled. Lowe’s has a few of the common hoyas from time to time. If you are fortunate to live in or near Wilmington, NC, you might find some really rare ones there, thanks to Lowes’ garden shop employee, former HIS board member, Paula Jordan. Marie Selby Botanical Garden If you live in or near Sarasota, FL, Selby has a gift shop with many plants, including lots of hoyas. Other botanical gardens all over the country have gift shops where plants are often offered for sale at very reasonable prices. Those I’ve visited don’t even require that you pay admission to visit the gift shop so, if you have a botanical garden near you, go there first. You’ll help yourself and you’ll help the garden. September Song Nursery, 12415 S. Toutle Rd., Toutle, WA 98649. This one’s list has expanded from just a couple of hoyas when listed in The Hoyan last year to an impressive list of about 50, mostly mislabeled, species and/or cultivars. Customers report that the dealer is very pleasant in the area of customer relations. Paul Shirley: Julianastraat 16, 2771 DX Boskoop, Netherlands, e-mail: paul@paulshirleysucculents.nl. On line at http://paulshirleysucculents.nl/Hoyas.htm. This is a very long list of unidentified and misidentified plants. Bob Smoley’s Gardenworld, 4038 Watters Lane, Gibsonia, PA 15044, Phone: 724-443-6770, on line at http://bobsmoleys.com.html. Claims to have 170 species of Hoya but only has 170 names. Several customers have warned that complaints aren’t welcomed, especially if told that what he sent to you is not correctly labeled. Unless you’re a walk-in customer who can see what you’re buying first, count on getting mislabeled plant material served up with an attitude! Tropiflora, 3530 Tallevast Rd., Sarasota, FL 34243. I’ve never purchased from this source but in a “customer satisfaction” survey conducted by HIS in 1999 this one was highly rated. Out of all the dealer’s listed there, only Duffey’s scored higher. Watch for more dealers in future installments. THE BIG CAN OF WORMS AWARD for the most OBNOXIOUS HOYA WEB SITE goes to http://magdoch.free.fr/hoya.html and it’s gallerie page http://magdoch.free.fr/list.htm - The most annoying thing about it is the lousy music which drowned out Brahms 1st Symphony which I had playing on my CD when I accessed this site. Why do people insist on forcing others to listen to what they call music in order to view their web sites? It just creates ill-will! Bad as the music is to me, it is still the best part of this site. Most of the names I found are misspelled and none of the pictures I clicked on are what they are labeled. Most of those I clicked on gave me no way to go back or forward so that the only way I could view the next picture was to re-enter the URL and have the homepage come up again. Once, when I clicked on what I thought was a hoya picture I got the home page of the site’s designer (a commercial web page design company that was obviously overpaid for this mess). Most hoya growers eventually want a greenhouse. Dues are: U.S. $28/yr; Canada & Mexico $30/yr; Overseas $31/yr. Send only U.S. funds drawn on U.S. bank or International Money Order.